I have done a revision of both John Bain's Chess Tactics for Students and Torsten Mattsson's - Basic Checkmate Patterns. My initial revision of both was 6 spaced repetitions, the 6th repetition being 13 days after the completion of pass 5. It has now been about 7 weeks since I completed Bain and 5 weeks since I completed Mattsson. I completed 1 additional pass of both books. Since finishing Bain, I also started on a supplementary set of problems I had the most difficulty with, defined as any problem I was unable to finish in under 15 seconds at least twice out of the last 3 repetitions. This represented 58 problems or 14.9% of problems. 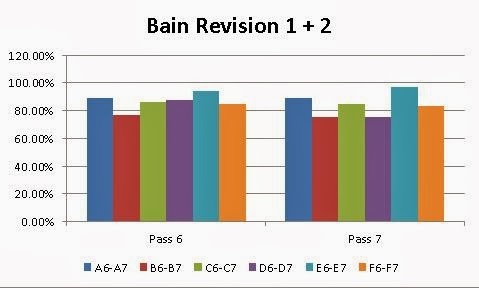 The following chart is the supplemental revisions combined with the stats from revision 1. Despite being a set of problems I had lots of difficulty with, I had an initial success rate of 55.17% and finished at 94.83%. If this had been a normal set, the initial and final scores would've been my 2nd best of all sets. Maybe surprising considering the difficulty I had with them, but at the same time I had studied them previously which may have helped when focusing solely on those problems. This was also the 1st time I had used Chess Hero for working problems. I attributed some of the increase to it being more accurate at keeping time vs Anki, although it doesn't record time in tenths of a second like Anki does. Not too bad after a 2 month interval, although some of that can be attributed to the supplemental set in between. Overall I solved 84.08% under 15 seconds, down slightly from 86.38% for pass 6. A lot of that decline can be attributed to the bad results from set D7. I was intending on doing all of Bain in one day, but stopped after D. After 3 other sets of problems combined with my normal set of Heisman problems, I may have been suffering from tactics fatigue late in the afternoon. The rest of the decline can be attributed to being slightly slower than 15 seconds. Other than set D, the percentage of problems I was taking way too long on or getting wrong was ~10% or less. My original supplemental set was 58 problems, and in this revision there were 62 I didn't complete in under 15 seconds. Only 5 of those problems were overlaps from the supplemental set. 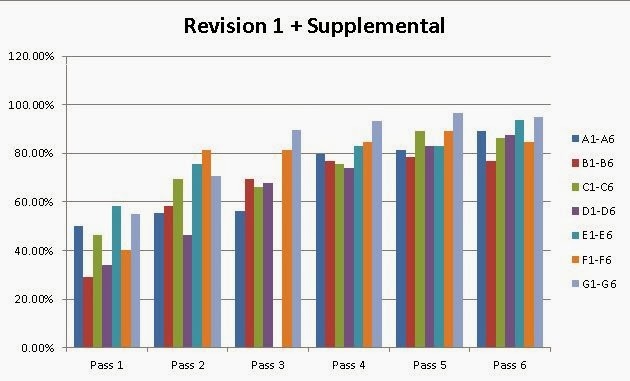 In other words, 13.6% of my success rate in revision #2 can be directly traced to my supplemental training which was only completed 2 weeks before revision #2. My success rate would've been 70.48% without the supplemental training. I don't know what to think of this. 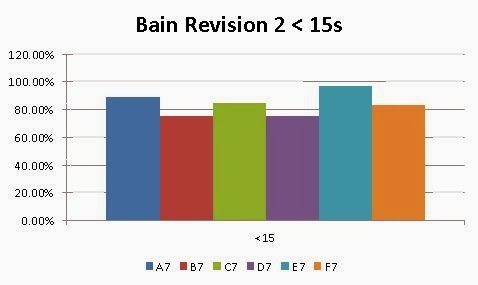 An average of 70.48% would be equivalent to my success rate after my 3rd repetition in revision #1. However, I did learn about 70% of the way through Woolum that I was going about the training wrong. Up to that point, I had been moving on after 30 seconds whether or not I had the solution. Dan Heisman said I should be giving myself much more time to solve the problem initially and giving myself less time later. He suggested 6 minutes, although I settled on 3. So it's possible that I wasn't giving myself enough time to study and commit the pattern before I moved on to a new one. Using the new method, I'm solving most of the problems early on and not concerning myself with speed. I won't be able to test that hypothesis until I do a revision of Woolum around April 7th and even then it could be iffy since I didn't change methods until I was mostly done. Dan Heisman's Back to Basics: Tactics is the 1st problem set I've done entirely with this new method. Only 44% finished, but if my initial stats are any indication, my final success rate is going to exceed both Bain and Woolum and according to Bright Knight's analysis, Heisman should be harder than either of the other tactics books. So that may be proof that the new method is making it easier for me to learn new patterns initially. No word on how it helps long term retention. Of course, the increase could be mostly attributed to using Chess Hero instead. No way of knowing right now but I'm optimistic. And regardless, I know I'm seeing more tactics in actual games and it's helping me make safe move choices. Not much to say here other than my retention for these problems appears to be much better than Bain. I am basically the same and I didn't do any supplemental problems in between. I plan on doing a 3rd revision for both of these in about 2 months time with no supplemental problems in between for Bain. I'm also going to split it up over 3 days to avoid any potential fatigue problems.